A U.S. reality TV star is garnering online attention and praise for her tough-love approach to parenting. 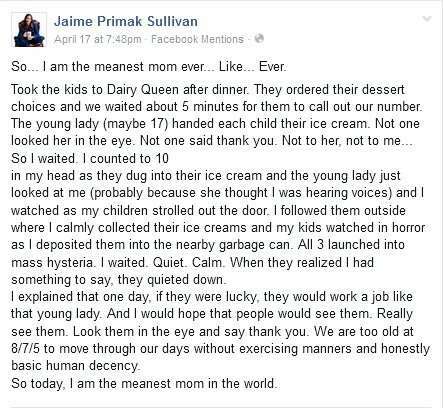 Jaime Primak Sullivan, star of Bravo’s Jersey Belle, was appalled by her kids’ dismissive treatment of a Dairy Queen employee when the family was out for ice-cream this past weekend. Not one of them said “thank you” to the young lady behind the counter or to their mom for purchasing the treat. In an online post that has since gone viral, Sullivan explained how she calmly counted to 10, gave herself a silent pep-talk, then collected each of the desserts and threw them in the garbage while her children looked on in confusion and horror. Once everyone settled down, Sullivan says she explained to them the importance of treating people with respect and to really “look them in the eye and say thank you.” At ages eight, seven and five, she says her kids are too old to overlook the importance of basic manners in everyday life. Jaime Primak Sullivan’s Facebook post that has since gone viral. The reaction to Sullivan’s post has been overwhelmingly positive with many posters praising her tough-love approach to parenting and sharing similar experiences from their own lives. The post has been shared 44, 000 times on Facebook and has drawn more than 350,000 ‘likes’ in just four days. 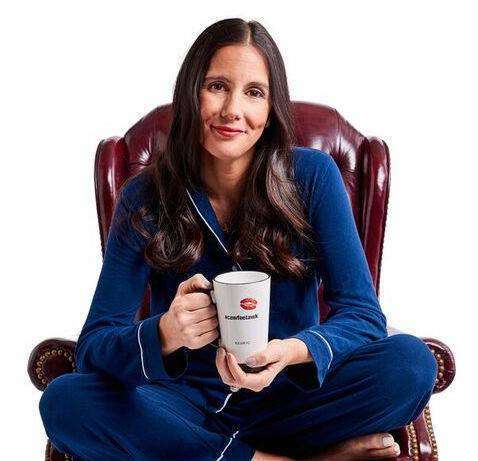 In a subsequent video blog on her Facebook page, Sullivan says she viewed the Dairy Queen experience as a “teachable moment” and that a more measured response would not have yielded the kind of long-term impact she’s was looking for.